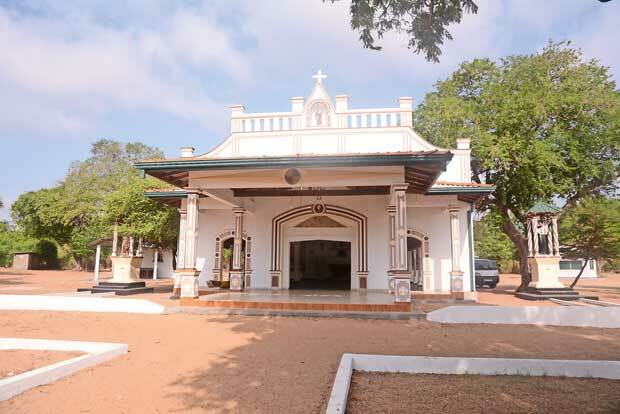 The Pallekandal Catholic Church inside Wilpattu National Park made headlines after environmentalists raised concern that the constructions of the church were being expanded, destroying the natural beauty of Willpattu forest. Despite environmentalists having held many conferences to raise public awareness and inform responsible government authorities, no action was taken by the relevant authorities. The church is believed to have religious and historical significance since the days of Indian Catholic Missionary Joseph Vaz before the establishment of Wilpattu as a National Park in 1938. According to an announcement by the Roman Catholic Church, Joseph Vaz who came to Sri Lanka in 1687 had visited Pallekandal and put up a little chapel. The chapel has now been revamped and is handled by the Parish Priest of St. Jude’s Church, Wanathawilluwa Father Prabath Sanjaya under the purview of the Chilaw Bishop Valence Mendis. A small scale feast was annualy held at the Pallekandal shrine with a little number of villagers who set up temporary shelters, which were taken down after the feast. 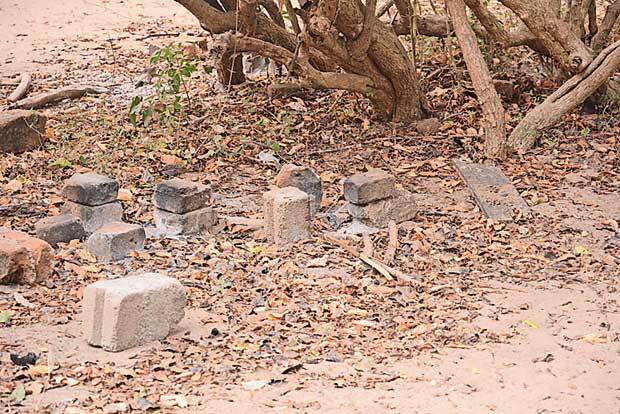 However, according to environmentalists’ claims, the church running within an area of less than a quarter of an acre, started to be expanded and renovated, causing damage to the wildlife in Wilpattu after 2011. The Daily Mirror received a comprehensive document prepared by the Wanathawilluwa Divisional Secretary’s Office regarding pre and post activities of the Pallekandal feast held in July, 2016. The main mass of the Pallekandal Church was planned through discussions with the Deputy Minister of the Tourism Development & Christian Religious Affairs Arundika Fernando in May, 2016. During the discussions, issues pertaining to the devotees such as how to control the vehicle traffic, where to park the vehicles, arrange space to park them, repair work of the road used by devotees, building temporary toilets, providing food and drinking water facilities, constructing stalls, emergency health requirements etc. were focused. The repairing of the Puttalam-Mannar Road was done by the Road Development Authority (RDA) upon directions given by the Deputy Minister. In June, 2016, giant water tanks were placed at the church premises after clearing the trees and plants in that particular area. Another document prepared by the Parish Priest of Wanathawilluwa St. Jude’s Church Father Prabath Sanjaya also stated that the Puttalam-Mannar road was expanded by the RDA so that two vehicles could travel at the same time. The environmentalists slammed that the road which was first built by armed forces during the tough time of the LTTE war, was now expanded and renovated for the Pallekandal Church devotees by cutting trees in Wilpattu. When the Daily Mirror visited the Pallekandal Shrine, we witnessed several new constructions and some unfinished constructions. The vicinity of the church which was surrounded by plants and trees of the Wilpattu was now full of rubbish. Empty plastic cans, polythene bags and wastage have destroyed the natural beauty of the surroundings. Not only that, but also the foot prints of elephants could be seen all over the place. It proves that the elephants too roam in the church areas because it is their habitat. Environmentalists maintain that unnecessary renovations were done under the blessings of the politicians who try to interpret this as a religious need forgetting the grave environmental damage caused to the wildlife of Wilpattu preservation. Legal Counsel Wardani Karunaratne of Environmental Foundation Ltd. (EFL) one of those organisations opposing the Pallekandal expansion, had told a news conference that the constructions of Pallekandal Church are in direct infringement of the Fauna and Flora Protection Ordinance. However, Wanathawilluwa Divisional Secretary H.M.S. Herath assured that the church authorities had sought the permission of the Department of Wildlife Conservation although she failed to present any legal document to show the given permission. 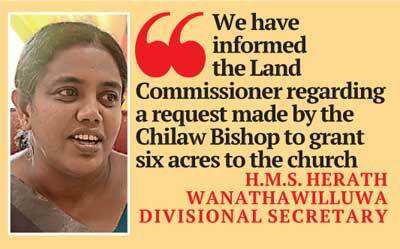 She also said that they have informed the Land Commissioner regarding a request made by the Chilaw Bishop to grant six acres to the church. She added they couldn’t do anything against the constructions at the church for two reasons; first, they are done with all political powers which she denied explaining more and the holy place had originated before the Wilpattu National Park was upgraded to National Park status in 1938. 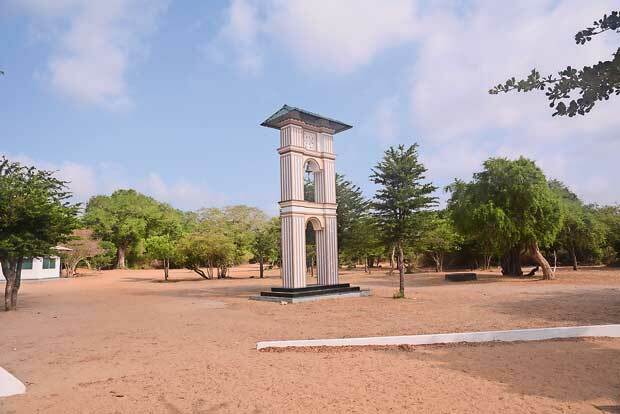 Meanwhile, Wilpattu Park Park Warden Manoj Widyaratne said they were at the moment seeking legal assistance to file a court case at Puttalam Court against the illegal constructions of the Pallekandal Church with the purpose of re-taking state owned land. “There are nine constructions built during past three years adjourning the church without seeking legal permission from the relevant departments. We have been waiting too much until the unlawful constructions came to an end but to no avail. Despite several warnings to the church, they did not stop so that this has to be solved at legal level other than discussion level,” he said. “Elephants still come to the lands where the church is located. The foot prints of elephants can be seen all over the place. This is actually not a religious issue but an environmental one. We also want to stop this destruction by any means. Such anti-environmental activities should be stopped. The expansion of the church began several years ago until when it had only an old shrine. The further constructions were begun with the blessings of the government. 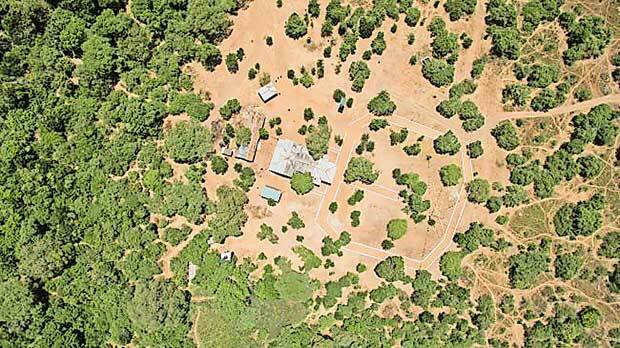 The church had requested approval to use six acres for their religious activities but the approval was not granted. Incidentally, they use more than the requested extent of acres already in violation of the laws and regulations of the Flora and Fauna Act,” he said. 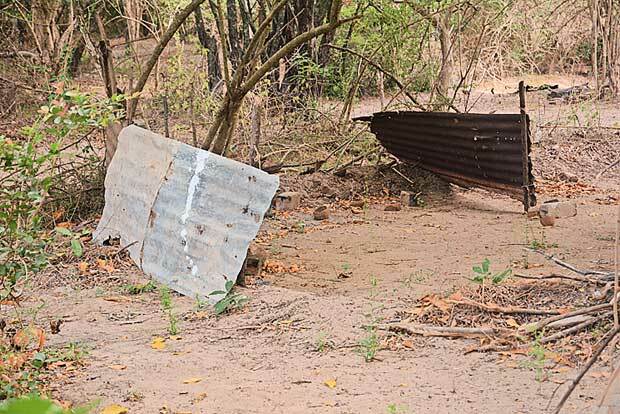 The Wildlife and Nature Protection Society (WNPS) had recently complained to the Vatican Embassy against the Chilaw Bishop who they said was responsible for the destruction caused to the national park. WNPS President Rukshan Jayewardene said they had a very productive discussion with the Bishop of Chilaw and his team, at the Vatican Embassy when the complaint was heard. “We have pointed out violations of the Fauna and Flora Protection Ordinance and keeping the Forest Department which has no jurisdiction whatsoever over these lands or the Wildlife Department which has to uphold the Fauna and Flora Protection Ordinance without fear or favour. Being informed does not legitimise or legalise these activities,” he said. Speaking on the Wanathawilluwa Divisional Secretary who is currently working on to give 6 acres to the church from Wilpattu Lands, Mr. Jayewardene of WNPS said neither the Wanathawilluwa Divisional Secretary nor President of Sri Lanka could request or seek permission for activities within a National Park. 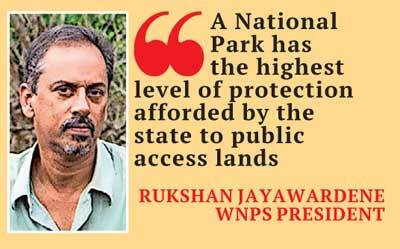 He said they did not have the authority to get land within a Gazetted National Park released for any purpose. “A National Park has the highest level of protection afforded by the state to public access lands and is strictly governed by the Fauna and Flora Protection Ordinance which is the law governing all such lands. It is declared and maintained for the protection of all animals and plants falling within its boundaries and only secondarily to an area for human access and activity but strictly governed by the FFPO. Much of the confusion and problems arise when the law is not fully understood or not fully enforced, or in attempts to subvert or ignore it often by the very people charged with upholding those laws,” he explained. The environmental organisations and the people who are concerned about the issue are still waiting until a responsible government authority solves the Pallekandal issue without dragging it more. In an exclusive interview with the , Bishop of Chilaw Valence Mendis denied all the allegations adding that he would look into the matter again and take necessary action if any illegal activity was going on. “We deny the allegation that damages were caused by activities relating to the church. The people will not destroy the forest when they come for the mass. They come only for two or three days. I want to highlight that the allegations have been exaggerated. This is merely a religious matter. “We have absolutely no idea to expand the church as such. There are no more buildings in the church premises other than a water tank. The number of devotees coming to the church is increasing and I can’t stop people coming. The repair work of the church was started soon after the war. The front verandah was the only expansion work done within the church premises after the war. Considering the convenience of the pilgrims when the mass is held, we got the admission from the authorities to set up an open verandah,” the Bishop said. Commenting on a car park which was allegedly built by clearing trees and plants of the Wilpattu Park, he said it was not made a car park but just a naturally open space in the forest. He said no trees were cut down to make a car park or for any other purpose. Emphasising that all these activities were done under the supervision of the Forest Department and Wild Life Conversation Department, he said that they would never break the law of the land for religious purposes. “I will look into the allegations whether any unpermitted structures have been put in the church premises without my permission. I would not allow anyone to fell trees in the Wilpattu National Park. We too love nature,” the Bishop said. Meanwhile, he said that they had written to the President, requesting him to release six acres to the church adding that their only concern was to hold the mass properly for the devotees who come to Pallekandal annually.